Eateries at the Curve come and go. And as I was walking towards the Ikano link bridge on the second floor of The Street, I came across Waroeng Penyet. The font for their signage also abit cartoonish. Quite striking la I must say, so I got detoured and stuck my nose at the glass. Found out that this is an Indonesian restaurant.. then got TV play Indon Rock MTVs.. so nice.. So we planned to try out their food one day, and we did find the time to drop by. I had no idea what penyet means until I came here. It means flattened. So The dish above is the Ayam Penyet (RM7.90), which means the fried chicken was flattened with a roller first before it was fried. Apparently this makes the fried chicken more tender and moist. Which we found to be very true. You see those crispy batter , whoa , those are so delicious they are to die for. I remember as a kid in my primary school, our chicken rice stall used to serve only Fried Chicken rice. And sure enough we used to ask the uncle to add the crispy batter... Obviously good stuff like that is bad for your health, go figure la.. The ikan bakar (Rm9.90) came out looking very presentable although I was hoping the fish to be alittle bit bigger. 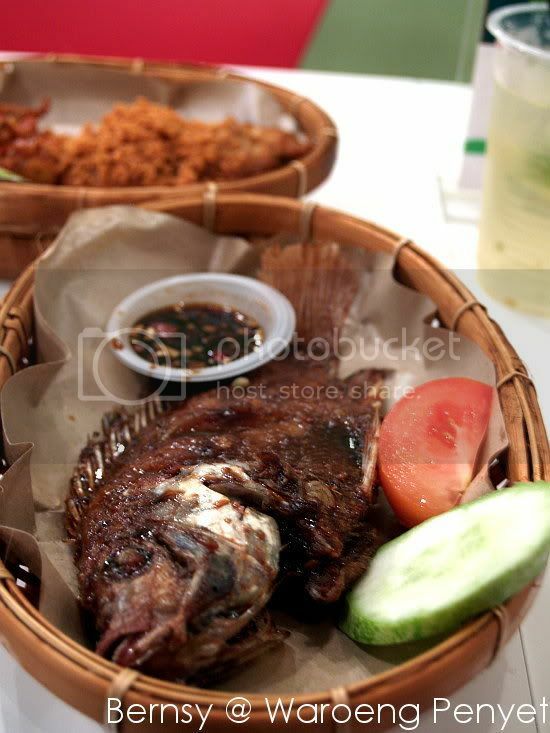 Its a small size Telapia which is grilled on an open fire. Hence, it tastes a bit like a smoked fish. The little saucer there contains the secret to making this dish superb, its the kicap cili, bawang and garlic mix for grilled stuff. 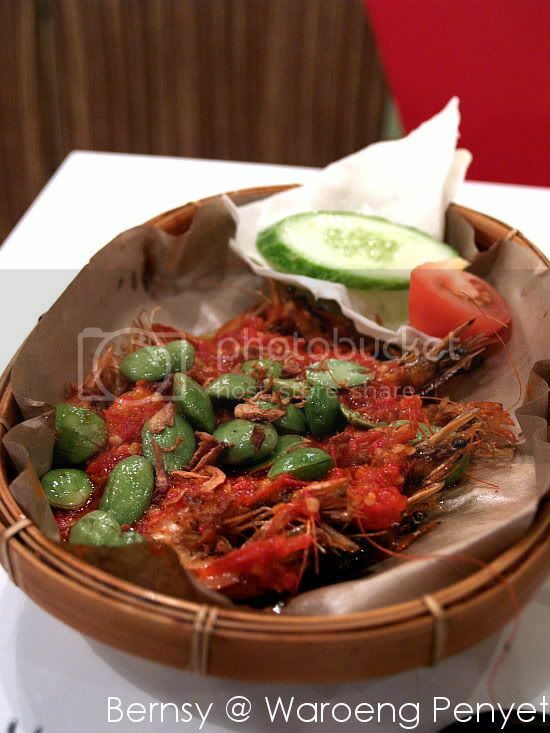 This next one is called the Pete Udang Berlado(RM7.90), better known as Sambal Petai Udang. I give this an A+ and seriously their sambal petai is superb. The petai was fresh and very aromatic, plus the chili looks like it was fresh out of the pestle & mortar. This is the first time I have tried their Jus Jeruk limau which I thought tastes like , Kam Kat drink, which you can find in the normal chinese kopitiam. Really nice, cooling and refreshing drink after a meal full of chilis. Of course this is their only outlet in KL, but hope they could open up more outlets. dude i was just about to go to the restaurant. 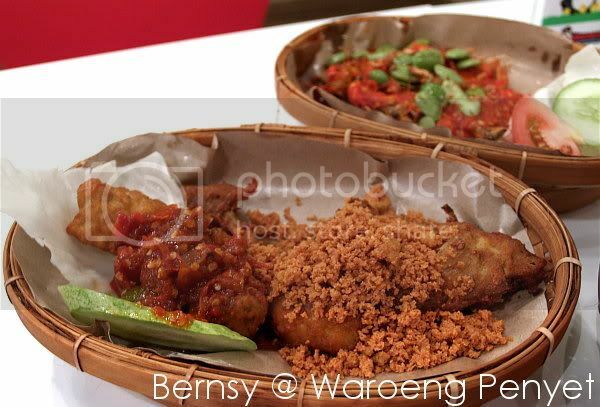 the ayam penyet looks good!!! Wah, a good place for anger management. Pissed off with someone? Just go and bash 'em chicken until penyet. that's the best thing about indonesian sambal..it's made fresh! 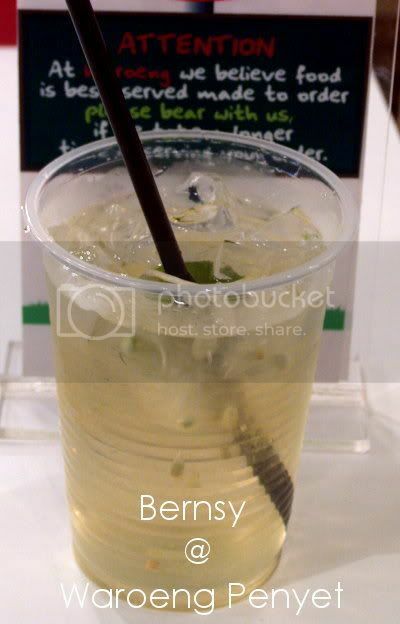 with a dash of lime juice, shiok! definitely no kissing with that amt of petai..
i saw some signboard bout ayam penyet b4 when i was at bali, never knew what was it until i saw your pic. niceeee!!! Their sambal is a must try !!!! damn spicy. Food taste great but portion too small for me. arrghhh now i'm craving for petai!!! !